We carry a full line of patio covers and carport kits, designed to protect your car or your backyard deck/patio from the elements. Our line of patio roof kits include Canadian-made high quality patio roof systems, which are generally maintenance free and offer years of worry free use. For fixed aluminum awnings, you can choose between 3",4.5" pr 6" insulated aluminum patio cover kits, metal W pan & flat pan patio cover systems. 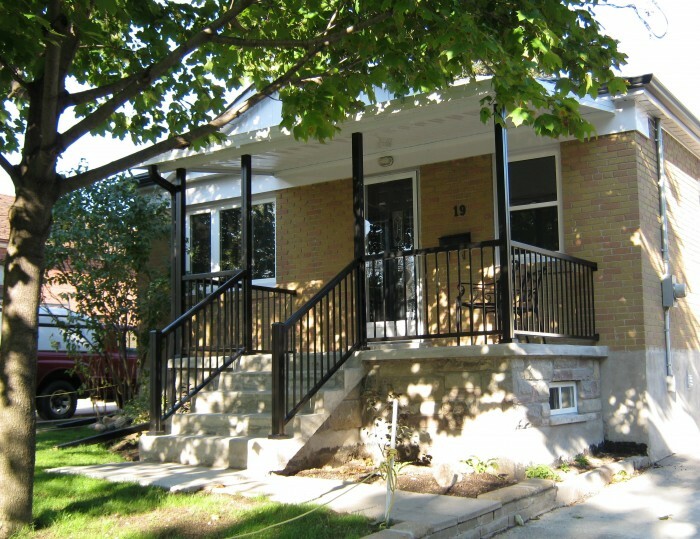 We also have a large line of high quality Canadian made retractable patio awnings. These exceptional products are manufactured in Quebec to handle our sometimes harsh Canadian winters, and literally, provide shade for your deck on demand. 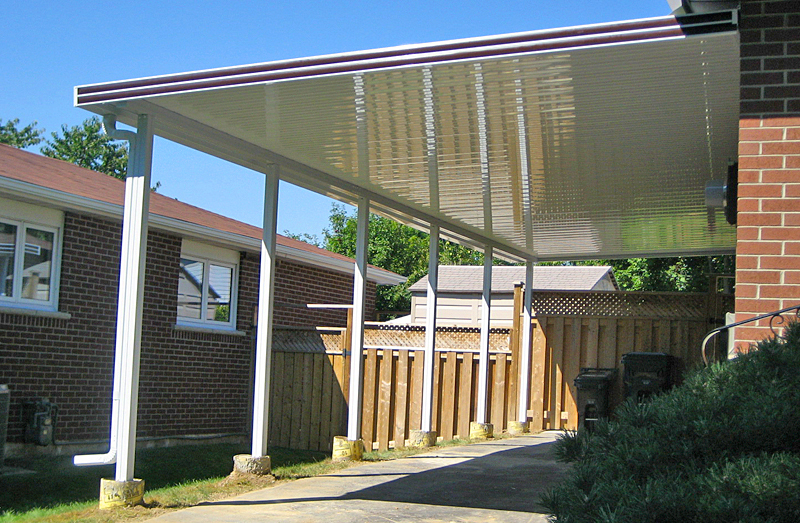 All our patio cover system are easy to install for the handy DIYer, and suited to your home, cottage or RV. Detailed instructions are instructions are provided and we are also available for phone/email support before, during and after installation. Our insulated and aluminum structures are designed according to IBC standards and can be made for all municipal load ratings. Almost any size and load condition can be accommodated. 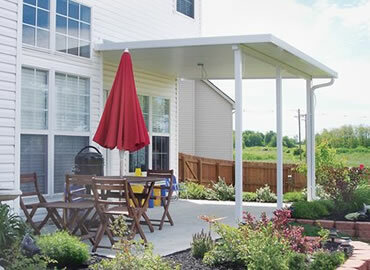 Looking for a different style of shade cover for your backyard? Checkout our range of maintenance free vinyl pergola options. Whatever size patio roof you need, we have you covered. With 3 thicknesses of polystyrene core insulated aluminum panels, these patio cover kits can accommodate most snow loading requirements. A simple beam and post arrangement keeps the patio cover or carport clean and sharp looking. These interlocking panels can be walked on, insulate against heat transfer and provide a finished ceiling that maintains its new look for years. Easily enclosed to provide a full 3 season room at a later date using our screen wall kits or vinyl lip frame windows. 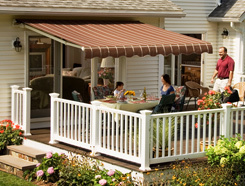 Our line of retractable patio covers are designed with the DIY homeowner in mind. Made with the highest quality Italian designed and manufactured internal parts and made in Canada frames and fabric, our line of manual and motorized fabric patio covers are an easy decision for your backyard. We offer three levels of quality retractable patio awnings with various options giving you a wide selection of modern styled awnings provide shade for your deck or patio. 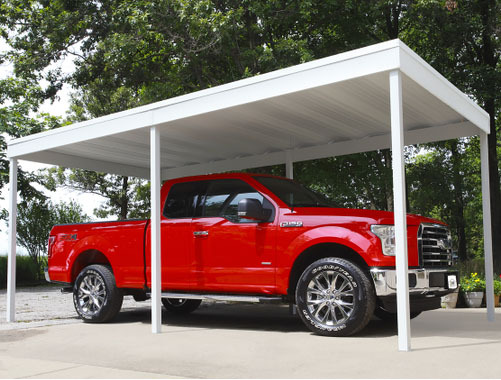 With pre-cut, pre-drilled, and well labeled parts, these DIY steel carports can be built on your own, saving hundreds on professional assembly. It's the perfect way to get that extra storage space and protection for your cars, trucks, boats, tractors and other lawn equipment. Three gages of aluminum pans, beams and posts - all in several colors and an almost unlimited size range! Designed for "on site" final cuts by you, these patio roof kits add value and functionality to any home, cottage or trailer. Beautiful flat finished roof on the underside with minimal maintenance to maintain its clean finish. The aluminum Flat pan patio cover systems are ideal for the price conscious home owner, and can be screen in at a later date! Three gages of aluminum wpans, beams and posts - available in several colors and almost any size range and load condition! Similar to the flat pans, these are designed for "on site" final cuts by you, and delivers similar value as a carport or patio cover. Enjoy the satisfaction and flexibilty of completing this DIY project on your own. 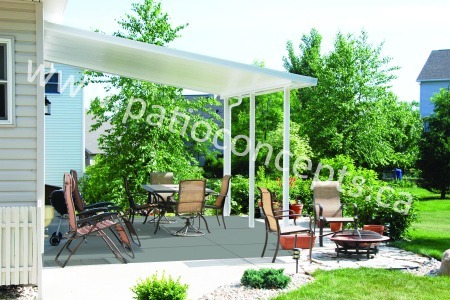 The aluminum Wpan patio cover kits are the most economical option for fixed aluminum awnings, while still providing years of solid performance and beauty. Economical and practical patio cover solution primarily for RVs and trailers, but usable anywhere you need shade. Made with high quality 14oz vinyl materials, this deck cover system is maintenance free and designed for years of worry free use. 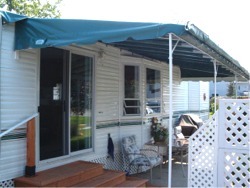 For something more permanent than a simple umbrella on the backyard or trailer deck. We carry over 100 different combinations of patio covers and carports in sizes and colors designed to fit most decks and patios. If you don't see it here, call us, we will be pleased to advise and assist.